VK2DYM'S MILITARY RADIO AND RADAR INFORMATION SITE. THE TRUTH ABOUT THE RADAR SET IN DARWIN ON 19TH FEBRUARY 1942.
shipped to Darwin. As you can see it is a very robust construction, meant to withstand ocean storms. On 19th February 1942, Darwin (Australia) suffered the first of a number of devastating Japanese air attacks and many civilians and service personnel were killed or injured. It was a serious wake up call that showed Australia was vulnerable to direct attack and pretty defenceless. The Government held a secret Royal Commission immediately after the raids and examined the circumstances, including evidence on the radar defences. Despite the fact that the RAAF had a brand new Air Warning (AW) radar set in Darwin, the city received little warning. In fact when one reads the Royal Commission evidence, it was a debacle from start to end! Over the years there have remained several unresolved questions. In particular, a number of later accounts of the development of radar in Australia blamed the RAAF for the delay in getting the Darwin radar operational and infer that lives were lost due to the RAAF failure. "The set sent to Darwin was accompanied by technicians of the RAAF, who, although they were without manuals to guide them, felt confident of their ability to operate it. When an attempt was made they failed even to get the set on the air. While they were still trying to get it working the Japanese made their first raid on the town." when the first big raid came on the 19th February." Through her position at RPL Marjorie Barnard was able to interview the scientists involved in radar, including Dr. J. H. Piddington, and several defence liaison officers. "The evidence, while not conclusive, supports the radiophysics version." "...... there was an air-warning radar unit in the city but it wasn't working. It is a bitter memory for Dr. John H. Piddington, a top Australian scientist and developer of Australia's first radar. The air-warning unit, Australia's first was developed by a team of backroom boffins' led by Piddington, a civilian. 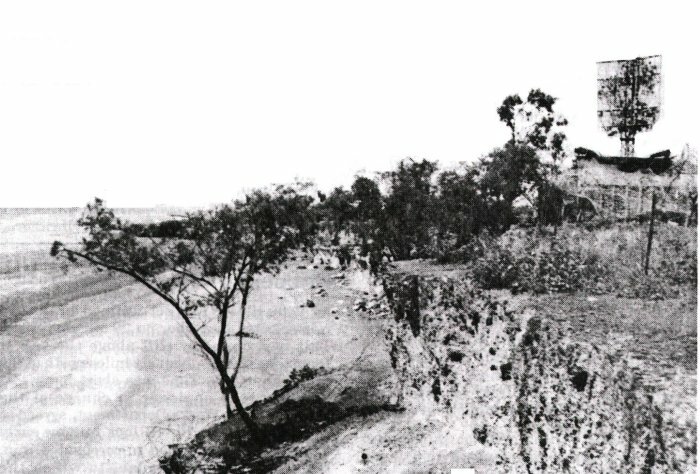 RAAF technicians who installed the radar at Dripstone Caves a few miles north of Darwin, days before the raid were still fiddling with the set when the first waves of Japanese bombers roared in. The RAAF experts, hurriedly trained at Richmond (NSW) had no manuals to guide them and were unable to grasp the intricacies of operating the set. Piddington's team - the men who could work the radar - were in Sydney, unaware that the set was in Darwin. And under a veil of secrecy RAAF chiefs made no effort to fly the scientists there to get the set functioning." "The fact is that the last Dakota-load of radar equipment, including the all-important aerial, arrived in Darwin two days AFTER the bombing. About a week later the radar was complete, but its performance was poor and Dr. Piddington was immediately called to Darwin to get it working. While he was getting there the RAAF technicians located the fault - a defective aerial feeder cable - and had the station working fairly well by the time he arrived. Nevertheless, they were extremely grateful to have the designer on hand to extract the last ounce of performance from it." Air Commodore George Pither had been in charge of the RAAF radar effort during WW2, as a Wing Commander, and was certainly in a position to know the truth. "In the event, on 19th February, a fortnight after it arrived in Darwin, Pither's Air Force technicians could not get the set working. It should have been there earlier and it should have been operating earlier', Piddington recalls: It only took us a week to get it going.' He and a colleague had found the set a hopeless mess' when they literally flew to the rescue: It took us a week to get it going because they'd made such a mess of it.' Once the two laboratory officers had succeeded, they were no longer silly backroom boys' but popular." When Ed Simmonds published the RAAF radar history titled Radar Yarns I discovered that several of the original RAAF installation party were still alive (and kicking) so I was able to obtain their stories first hand and to confirm from their movement and pay records etc what really happened at No. 31RS radar station. "The array had been assembled at the time of the first raid and was lying on the ground near the doover." The "array" was the radar antenna and the "doover" was the universal nickname given to the radar operating hut or tent. "The first problem was how to get the array into position. It was a prototype and built like a battleship. We tried every trick we knew and it was only after the incident when the rope broke (whilst trying to lift the antenna into position) that Harry Hannam, our first CO, decided to get help which came in the form of the US Services sending out a mobile crane and lifting it into position." "On 20 February 1942, the day after the first raid on Darwin, I was taken off No.2 Radio Officers' Course and posted to 31RS at Darwin. When some distance from Darwin you could see smoke still rising from the city. We eventually landed and found transport to Dripstone Caves where we met Harry Hannam and Bruce Glassop who were anxiously awaiting the equipment to complete the installation." exactly what the equipment was but I do know Harry Hannam was waiting for the last load to complete the station." that on 21/2/42 the array was half in position." These responses from a number of eyewitnesses show clearly that the radar set was NOT even installed on 19/2/42 and that the last of the equipment did not arrive on site at Darwin till 22/2/42. The claims against the RAAF are demonstrably quite false. Therefore where did the damaging claims originate – the claims that the set had been installed at the time of the first raid and the RAAF was incompetent and to blame for the lack of warning to the military and Darwin residents? An analysis of all the publications and the references shows that the source of the criticism can be traced back to just one person, Dr. John H. Piddington, the scientist who was called to Darwin to fix the radar. Later authors have simply repeated and embellished his statements, seemingly without question. One wonders why the later authors ignored the published rebuttal provided by Air Commodore Pither following Dr. Piddington's article in the Telegraph? It is interesting to note that all the authors who accepted Dr. Piddington's version were also academics, employed in universities and government research establishments. "The whole debacle was the fault of George Pither who wanted all the credit for himself." Wing Commander Pither was the Director of RAAF Radar at the time, a most important and onerous role in the war effort but comments from those who knew Pither indicate that he was no glory seeker and simply wanted to get on with a vital war job. As a result of this review and all the evidence, it is fair to conclude that the RAAF radar personnel at Darwin early in 1942 were not to blame for the failure and can finally be cleared of any incompetence and can stand proud of their efforts. Radar Station RS31 at Dripstone Caves, near Darwin, circa March 1942. To the left is the coast line, in the centre is the crumbling cliff face and at the top right is the camouflaged antenna and sheet metal hut, with two roof vents. The radar that was installed at Darwin was the model AW, for Air Warning. 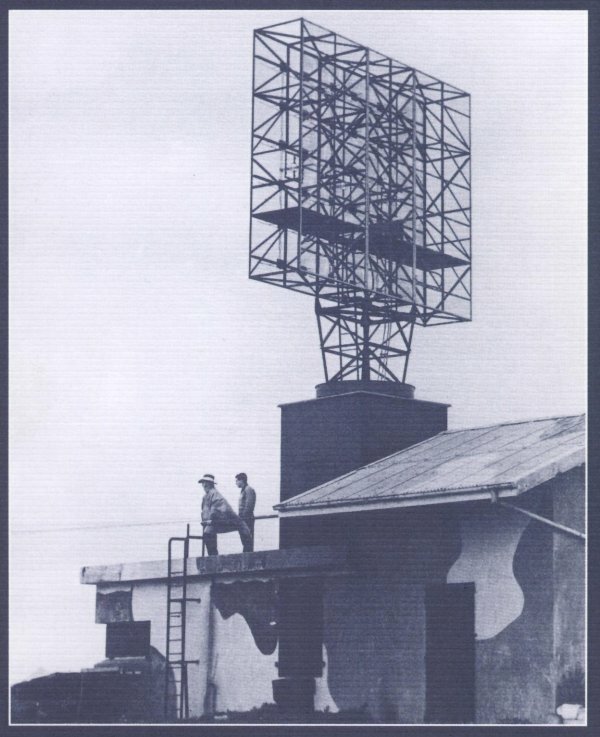 It was a hasty development of the Army shore defence radar and employed the same antenna array (see heading photo). My investigations show that it took a day for RAAF personnel at Richmond RAAF base (near Sydney) to hacksaw the array into parts small enough to fit through the door of a DC3. It then took three complete DC3 loads to transfer the radar equipment to Darwin, each round trip taking 2 to 3 days. From the airbase it was trucked to the coast and installed on a cliff overlooking the sea, at a spot called Dripstone Caves. (It was moved further inland several months later due to beach erosion threatening to wash it away). The radar station was given the designation RS31. Following assembly the radar did not operate satisfactorily and Dr. Piddington and another scientist, Bruce Taylor, flew to Darwin to assist. By Dr. Piddington's later account the RAAF had made a complete mess of the installation and it took him a week to fix it. Recent correspondence with the RAAF personnel seems to indicate that they might have been supplied with incorrect co-axial cable for feeding and matching of the antenna, a phased array. That cable came from RPL and my research shows that RPL had stocks of both 50 ohm and 75 ohm cable. The RAAF respondents say it was all very secretive and they are highly suspicious of the real cause of the set not working effectively, until new cable was supplied. Was there a cover up? The RPL had initial responsibility for all radar research and even manufacture. Relationships with the Armed services were not always cordial and there were some heated exchanges between them, mostly over delays, unfulfilled promises and too much research at a time when the services needed working equipment. The RAAF had longest contact with the RPL but eventually the services took much of the work away from RPL and collaborated with the PMG and outside manufacturers, or in the case of the Army and Navy they simply imported UK equipment as it became available. That eroded the RPL power base and seems to have caused some anguish. Dr. Piddington passed away in 2000. He refused to discuss my concerns and responded by letter as excerpted above. It would be wrong for me to speculate on why he made and reiterated his claims that the RAAF was at fault in Darwin. Please note, this article is copyrighted.